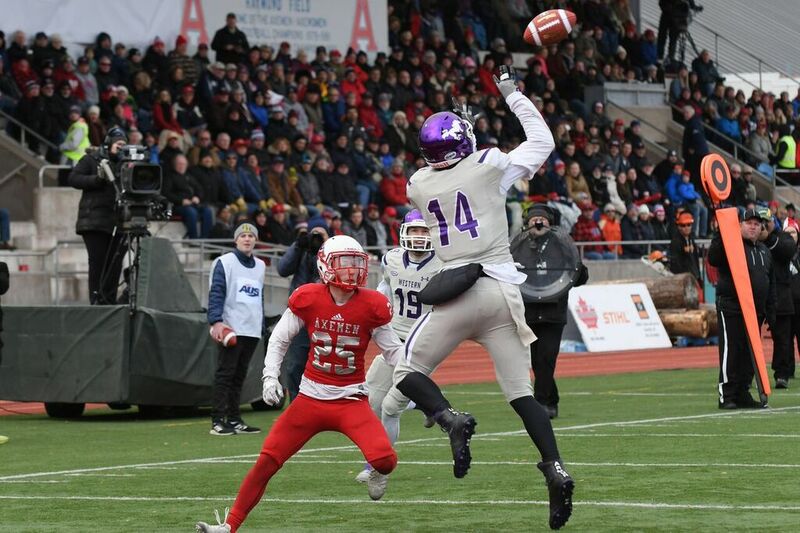 The Western Mustangs put on a record-setting performance on Saturday, beating the host Acadia Axemen 81-3 in the 2017 U SPORTS Uteck Bowl. The win was the second straight dominant performance for the Mustangs, who eliminated the defending OUA champion Laurier Golden Hawks 75-32 last weekend in the Yates Cup. Prior to Saturday’s game, the most points scored by one team in a U SPORTS national semifinal was 60 points in 2003 by the Saint Mary’s Huskies. 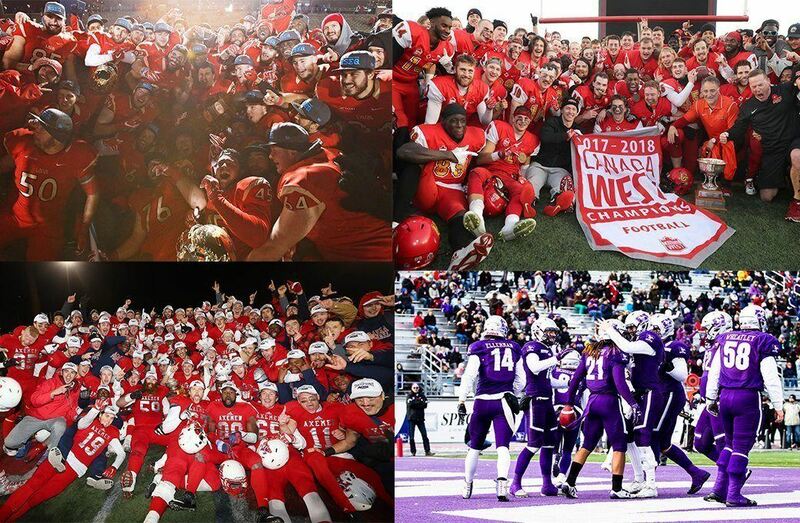 Chris Merchant, named the Uteck Bowl Most Valuable Player, delivered the knock-out punch with 200 yards in the air, while teammates Trey Humes and Cedric Joseph wore the Acadia defence down with 272 yards combined on the ground. Humes led the way with 172 yards and Joseph added 100 yards to the Mustang running game. Joseph finished the day with 13 carries for 100 yards and three majors. Humes posted 15 carries for 172 yards and one touchdown. Yannick Harou and Merchant added significant yardage with 98 and 54 respectively and two touchdowns each. I’ve got to give it up to my o-line yet again. They had an exceptional day on the ground today, really dominating performance by them. They really controlled the line of scrimmage and made my job a lot easier. Merchant completed a 23-yard touchdown pass to Brett Ellerman on Western’s first possession to give the Mustangs a quick 7-0 lead. On the next drive that followed a quick three and out by the Axemen, Joseph posted his first of three first-half touchdowns. The Mustangs scored on all of their first half possessions except their final drive at the end of the first half, where they opted to take a knee as the clock wound down, ending the streak at eight touchdowns and a 57-0 halftime lead. The Axemen opened the second half with a nine-play, 50-yard drive that was capped with a missed 33-yard field goal by rookie kicker Jarett Saumure. Western went back to work, pushing the lead to 67-0 on a Trey Humes touchdown rush from six yards out and a 20-yard field goal by Marc Liegghio. A Cody Cluett pass intercepted by MacKenzie Ferguson for a 30-yard return and the major, plus two-yard run by Harou for the major were the last points posted by the Mustangs. A Saumure 27-yard field goal broke the goose egg for the Axemen prior to Harou’s touchdown. That was the best competition we have faced. They win by an average of 35 points for a reason. They are a very talented team. We just couldn’t handle them today. They are a top-three team. Western’s Harry McMaster led all receivers on the day with 135 yards on five receptions and one touchdown. Acadia’s Eugene McMinns pulled in three passes for 48 yards and teammate Glodin Mulali and Cordell Hastings had 33 and 31 respectively. 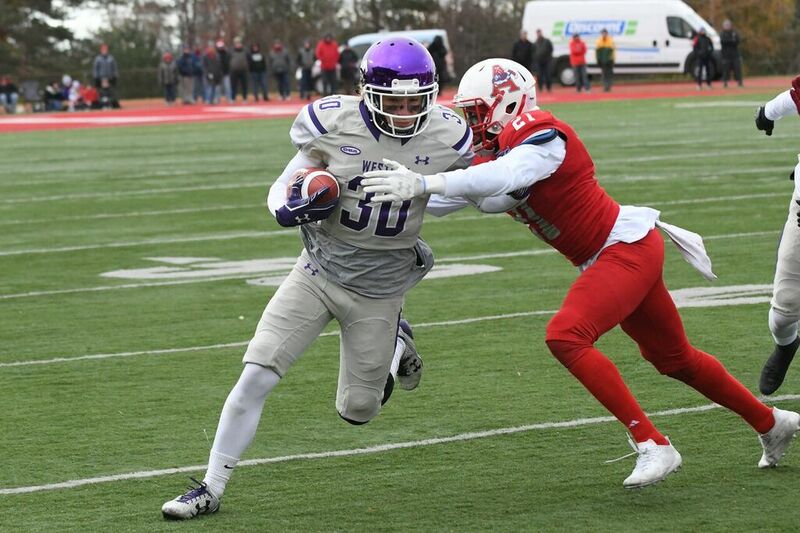 Western posted 689 yards of offense that included 451 yards rushing, surpassing their regular season average of 309. The Mustangs will face the winner of Saturday’s Mitchell Bowl between Calgary and Laval for the 53rd ArcelorMittal Dofasco Vanier Cup in Hamilton, Ont., on Saturday, Nov. 25. It’s amazing. Personally, my dad – he played university ball at Bishop’s – and he unfortunately never got a chance to go to the Vanier, so this is a real blessing for me to be on a national stage, compete against the best, and represent my family. The ArcelorMittal Dofasco Vanier Cup is set for Saturday, Nov. 25 at 1 p.m. ET / 10 a.m. PT at Tim Hortons Field in Hamilton and will be televised live on Sportsnet 360, Sportsnet 1 and TVA Sports, with coverage beginning on all networks at 12:30 p.m. ET with a 30-minute pre-game show. The game is also available online through Sportsnet NOW and TVASports.ca.